No, the client didn’t lie, you just never let her tell the truth. If you want good advice, this is it. Speak less, listen more. . . .
One technique I use to train students how to communicate with their clients is using wooden blocks. This technique was shared with me by a highly respected colleague. It consists of two sets of blocks pictured in the photo to the right. My students counsel live-clients and prepare their estate planning documents. If they were to approach that task like many attorneys do, they would have a checklist of items to be completed. Clients have no choice but to follow their attorney’s agenda with inquiries like, “Are you married?”, “Do you have any children?”, “What are their ages?”and so forth, until the questionnaire is completed. During the entire interview, the client is dying to tell the attorney about the disastrous process they experienced when their mother died and the family fought over every little detail and how two of her siblings will no longer speak to one another. She wants to make sure that her plan will avoid that problem if at all possible. Her attorney never heard about her concerns because it wasn’t on his checklist. The client departs and returns to finalize those documents later. The attorney presents them in nice simulated, leather binder and they part company. The client may never returned for future services. Nor is it likely that that client will ever refer others to that practice. Why? The attorney’s agenda never allowed the client to express herself and talk about what she felt was important. In fact, the client didn’t really understand why her feelings about her earlier experience were never heard. She thought that was important, but since he was an experienced attorney, she deferred to him. The truth is that the attorney never connected with the client. He never got to the root of the problem. The attorney who “processes” clients, produces their documents, and sends them out the door is, in my opinion, not that unusual. You need to connect with your client. That cannot be accomplished using a checklist approach following your agenda, and not the client’s. The only way to find out what the client’s agenda is, is to allow the client to set the stage and paint the picture that they wish to paint. If you “process” your client’s using a sterile checklist approach, you will be unable to compete with on-line resources. Because, that is all that they do – fill out the forms based upon sterile questions. There is no opportunity for the on-line applicant to express themselves beyond the format provided. You are not a computer; act like it! I select two volunteers. Each one takes one set of the blocks. One is directed to build something with the blocks in which all are to be touching one another. Then I instruct the other student to reproduce what the first student did assembly while in view of the first assembly. Of course, he replicates it without difficulty. I ask the rest of the students to give him a “hand” for his fine work. Next, they are instructed to take a position with their backs to one another so that they cannot view what their partner is doing. I tell one of them to reassemble the blocks in a different random pattern once again. Once that is done, I tell the student with the un-assembled blocks to reproduce what the other student just created using “leading questions” only. In other words, the answer by the other student must be “yes” or “no” or if 15 seconds elapse (as non-responsive), to ask another leading question in an attempt to recreate what the first student created. 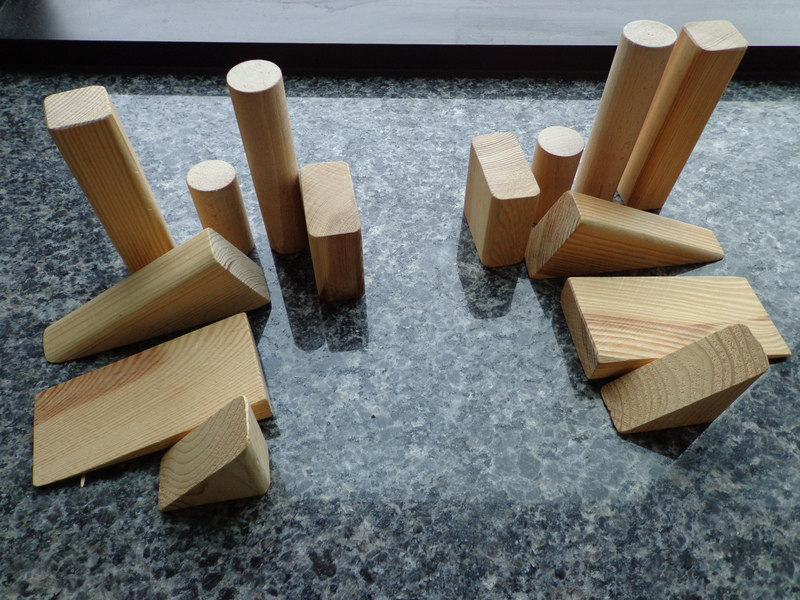 This leads to a great deal of frustration as the blocks consist of three different wedges, two different squared blocks and two different cylinders. They can’t be distinguished by color. Calling something a wedge is inadequate to distinguish one wedge from another. Also, the position of each block creates even greater issues of identification. The orientation as to which side is grounded is puzzling and how the position of one to the other can be appropriately described is even more frustrating. They struggle, but eventually the “assembler” will finish and have an assembly that barely resembles the other student’s assembly. When they turn around, they are shocked to see how different each assembly is from one another. After 13 years of using this technique three times a year, not once has a student completed this project with any degree of success. “Your clients have an assembly (picture) in their minds that you will need to replicate to address their goals completely” I tell them. However, the client has an infinite number of mental “blocks” to build upon. And, unlike this exercise, NONE of their block are identical to yours. Yet, if you attempt to construct their “assembly” by asking leading questions and forcing them to follow your agenda, it won’t work. You need to ask open-ended questions such as, “What brought you here today?” Tell me about your family? Tell me about your experiences concerning the transfer of property upon someone’s death in your family? Ask them about the dynamics of the relationship among their children. What are they attempting to accomplish with their estate plan? What are their most important objectives in passing their property? If you find yourself frequently prompting your client to explore, in greater detail, the information that they provide, you are probably doing what you need to do. Ask them for background and look for context in their lives. What experiences have they had with probate? If you allow them to talk about it, you will be better able to draft documents that address the issues they feel are important based upon their own experiences. When doing medical directives, ask them to tell you about their experiences when loved ones, who were incapacitated, were cared for in hospital settings. Frequently, they will get very emotional as they recall those experiences. They will be able to recount the way that family members “changed” during those interactions. Most of the time, you will find that your goal of gathering necessary information will be accomplished as the client’s exploration of those circumstances will contain the information you will need to craft documents that are best suited to address their concerns. As they describe their family and circumstances of illness or distribution of assets from those estates, they will give you all the clues you need to address their potential concerns. Use leading questions to follow-up and prompt them for more detailed information. Think of the interview as a funnel with open-ended questions at first, then use leading questions to fill in the details. But get the big picture first. Allow them to lead the conversation and you become the follower. Listen more, talk less. This way, they will feel empowered and satisfied that they got to tell their “story”. With that feeling of satisfaction will bring more referrals and conversations about how impressed they were with your understanding of their problems. This will build stronger relationships and increased business over time.